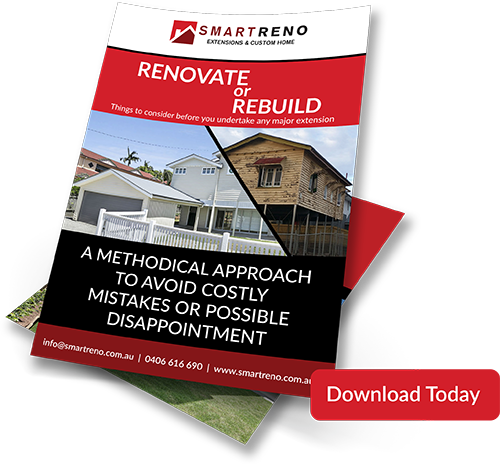 Thanks for requesting a copy of our e-book on Renovate or Rebuild. We understand that a Renovation, Knockdown or Rebuild is one of the biggest decisions you will have to undertake, and you’ve no doubt heard the renovation horror stories. At SmartReno, we know how to make a renovation or rebuild stress-free. We’ve developed a methodical approach to avoiding costly mistakes and possible disappointments, and we’ve pulled it all together in a handy guide for you. Feel free to download from here. We would like to follow you up by email in a couple of days to see whether you’ve had a chance to go through our guide and whether you have any questions. We’ve helped many, many people in the same position you are in. However, in the meantime, if you’d prefer to chat over the phone, feel free to click here to request a call back at a time that is convenient to you. We understand everyone wants to make sure they are making the right decision before they get too far into the process, so we typically undertake a project feasibility study, for $495. However, we’ve allocated two free project feasibility studies each month. If you’d like to take us up on this opportunity, please enter your details below and we will be in touch.